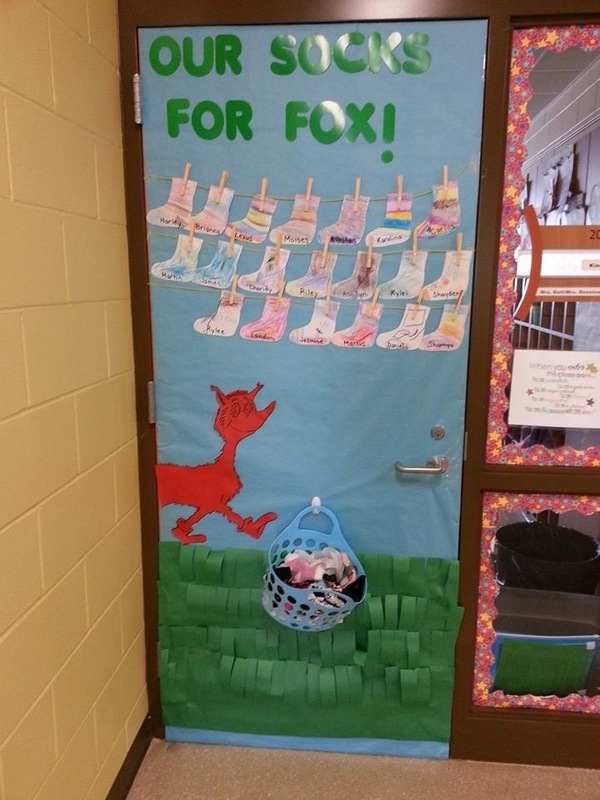 Fox in Socks classroom door | My Attempts at Being Creative! Since Dr. Seuss birthday was yesterday I decided to decorate our classroom door with a Dr. Seuss theme. I scoured through Pinterest and found a lot of really really cute ideas. I decided to go with this door theme that I found here. During writing on last Tuesday we read the book Fox in Socks. After reading the book I gave each student an outline of a sock and let them decorate them anyway they wanted to. I wrote each student’s name on their sock with a black permanent marker. The kids had fun decorating their socks, especially since we don’t really get to do any coloring in Kindergarten anymore. To decorate the door, with the help of my fellow co-worker, we put blue butcher paper over the door. Then I cut strips of green butcher paper and cut slits down the paper to look like grass. I then created the Fox in Socks by putting the picture on the Promethean board and tracing it. I used yarn as the clothesline and put clothespins on the door (I also backed the clothespins with sticky tacky to help hold everything up). I used a Command strip hook to hold the basket up and just put socks that I could not find buddies to in and hanging over the basket.